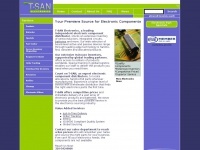 T-SAN is an Electronic component distributor with direct partnerships with all the major Asian electronics manufacturing firms. Your parts and components in stock and delivered just in time. The web server with the IP-address 173.248.187.77 used by Tsan.net is owned by MDDHosting LLC and is located in Denver, USA. 67 other websites are located on this web server. Most of them are provided in the english language. The webpages of Tsan.net were developed using the programming language PHP. The markup language of the website is HTML 4.01 Transitional. The website does not specify details about the inclusion of its content in search engines. For this reason the content will be included by search engines.